She was preceded death by Her husband of 70 years Max Johnson Sr, her parents and brothers William and Ona “Pete” Grant Jr. and granddaughter Deborah Reynolds. Wanda was retired from Standard Grocery where she worked for over 20 years as the Head Cashier. 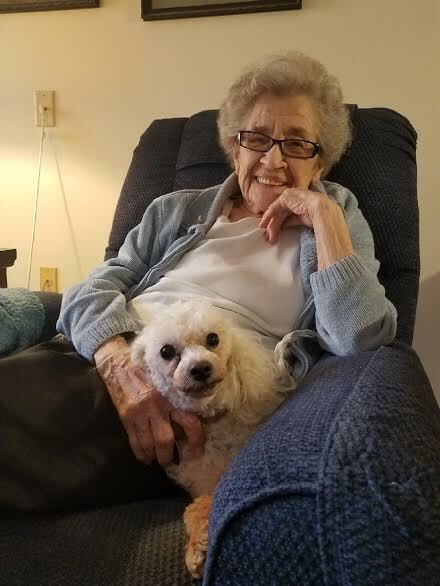 She was a wonderful cook and always ready to cook a meal for family and friends, we will forever miss her homemade chocolates at Christmastime. She was always ready to help those in need especially her children and grandchildren. She was beloved Mother Grandmother and Great Grandmother. Wanda is survived by her son Max Johnson Jr. (Susan) and Daughter Beverly Tallon. Grandchildren: Zachary Johnson, Matthew Tallon, Patricia Tallon. Also her “adopted” Grandchildren and Great Grandchildren, Jessica Boland, (Peter) Her son and Daughter Dylan and Norah Rose Boland. Also Stephen Hecklesberg (Jackie Nevis) and their children Alexis Bender and Cayden Carpenter and her little Poodle “Sophie” all of whom she loved dearly.